Com. M. Krishnan, Secretary General, National Federation of Postal Employees (NFPE) & Confederation of Central Govt. Employees & Workers, General Secretary, All India Postal Employees Union Group-C (CHQ), Leader, JCM Departmental Council, Department of Posts, Member, JCM National Council will be retiring from service on superannuation on 31st August, 2014. As per the decision of NFPE Federal Executive meeting held on 21-08-2014 and Central Working Committee meeting of AIPEU Group-C (CHQ) held on 22nd to 24th August, 2014 at Ongole (Andhra Pradesh) Com: M.Krishnan, will continue to function in the NFPE & P-3 CHQ till next Federal Council of NFPE (May 2016) and All India Conference of AIPEU Group-C (June 2015). He will also continue to lead the entire Central Government employees as Secretary General, Confederation till the next National Conference (2016). Com: R.N.Parashar, Asst. Secretary General, NFPE, will take charge as Secretry General, NFPE from 01-09-2014 till next Federal Council as per the decision of NFPE Federal Executive meeting. Com.N.Subramanian, Deputy General Secretary, AIPEU Group-C (CHQ) will officiate as General Secretary, AIPEU Group-C (CHQ) till next AIC, as per the decision of CWC meeting of AIPEU Group-C.
NFPE CHQ, AIPEU Group-C (CHQ) and the CHQs of all other affiliated unions of NFPE extend our best wishes to Com.M.Krishnan and we are sure that he will lead us in the coming days also. We are reproducing below the resolutions adopted by NFPE Federal Executive meeting and Central Working Committee meeting of AIPEU Group-C on the services rendered by Com.M.Krishnan. We are also reproducing a letter received from Shri.D.Theagarajan, Secretary General, FNPO. I. Resolution adopted by NFPE Federal Executive. The Federal Executive of NFPE records its full appreciation for the yeoman service rendered by Comrade M.Krishnan as the Secretary General of NFPE. The Federation has scaled new heights during his stewardship and the unity of Postal regular employees and Gramin Dak Sewaks entered into a new chapter under his leadership. The united movements of Postal Workers under the banner of Postal JCA as well as the independent struggles under the mighty National Federation of Postal Employees are further strengthened under his able leadership. He provided a militant, progressive leadership with farsightedness for the betterment of Postal Workers. It is under his leadership that the NFPE claimed its historic vanguard role of leading the entirety of CG Employees under the platform of Confederation of CG Employees & Workers and it can be seen that the movement of central government employees has launched a powerful movement including strikes for the establishment of 7th CPC with Comrade M.Krishnan as its Secretary General. The integration of Postal and CG Employees with the entirety of Indian working class organisations in developing the path of united struggles against the neo-liberal policies of Government has further been cemented during his tenure. The leadership of confederation has come back to the Postal Organisation after a long period of 44 years and comrade Krishnan is leading the movement of CG employees in the path of struggle with firmness and it is noteworthy to mention that the unity of all JCM National Council organisations has reached its zenith with all coming together in championing the cause of three lakhs of Gramin Dak Sewaks and thousands of casual labourers in Postal and CG services due to his firm efforts. Ideological education of all cadres and employees through several All India and Regional Trade Union Camps under the banners of NFPE and Confederation; Concrete organisational steps for mobilizing the women employees of Postal Department as well as the Confederation level are some of the landmark achievements of Comrade Krishnan. 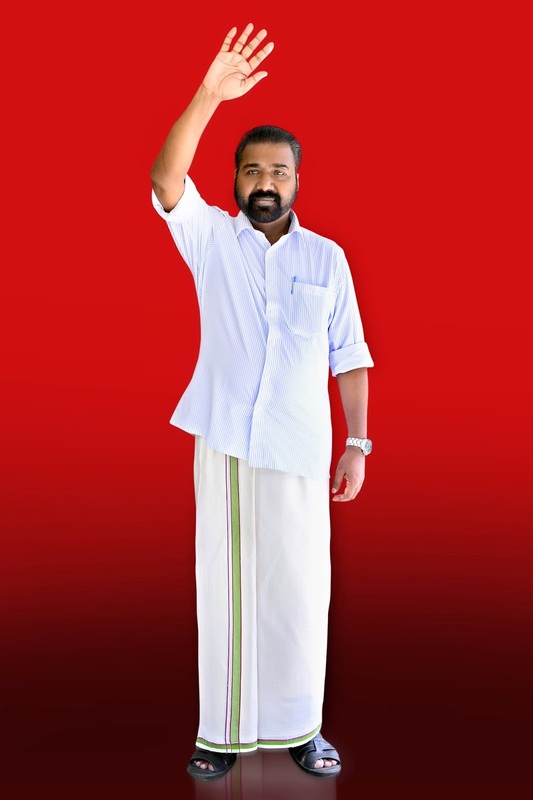 The National Executive notes with happiness that all the affiliates of NFPE have always maintained a unified stand on all important activities of the Federation and this unity is due to the confidence created amongst all affiliates by the unifying leadership of Comrade Krishnan. The relinquishing of charge as the Secretary General of NFPE by him due to his superannuation from the Government Service is a huge loss to the movement but the Executive wishes to get his valuable advice and guidance to the Federation in the days to come. The National Executive places on record its unstinted gratitude to Comrade M.Krishnan for his able leadership to the historic organisation of NFPE not only as Secretary General but in numerous other capacities as well during his long service. The Federal Executive further resolves that Com.M.Krishnan will continue to be in the Federal Executive of NFPE even after handing over charge, till the next Federal Council meeting to be held in May 2016. The Central Working Committee of All India Postal Employees Union Group ‘C’ (CHQ) held in Ongole (Andhra Pradesh) from 22.8.2014 to 24.8.2014 unanimously appreciates the sincere, superb and outstanding services rendered by Com. M. Krishnan as General Secretary of AIPEU Group ‘C’ (CHQ) and Secretary General of NFPE & Confederation during his tenure and like to place on record our whole hearted compliments,greetings and commendations to him and also acknowledge and recognize him for his unparalleled and appreciated service, which definitely resulted in charming the organization to new heights and also in settling many of the long pending demands of the Postal employees, especially Postal Group ‘C’ staff. Com. M. Krishnan’s contributions in enhancing the prestige and image of AIPEU Group ‘C’ and thereby NFPE as well as the Confederation, will be remembered forever. In order to strengthen the organization and also to enhance the organizing capacity of the rank and file leaders the P3 CHQ & NFPE CHQ under the leadership of Com. M. Krishnan is maintaining constant communication with the general membership through website and also the Bhartiya Post and Postal Crusader monthly journals. The Trade Union classes and workshops organized by Com M.Krishnan, General Secretary for the NFPE and the Confederation has also contributed to a great extent in improving the quality of the organization. The need of the unity amidst the working class of all sections as well as Government employees, organized and unorganised workers, he preached and also practiced during his tenure upsurge him to the standard of a great statesman and a living legend. It is only Com M. Krishnan, who spends more than 20 hours daily for the working class all along during his tenure. Com. M.Krishnan is a vivacious, vibrant,meticulous hard working and fully committed leader and is always working for the upliftment and welfare of the Postal employees, especially most down-trodden three lakhs Gramin Dak Sewaks. He has also extended his helping hand to all affiliated unions of the NFPE as the Member and then Leader of the JCM (Departmental Council) Staff side. He is also the All India Secretary General of the Confederation of Central Government Employees & Workers and is at the forefront in implementing all the programmes of the Confederation. The two days strike in February 2014 demanding the formation of the Seventh Pay Commission cut the ice and is one of the milestone in the history of the CG employees’ movement. Com M.Krishnan has pioneered and crusaded his best in making the General Strikes conducted as per the call of Central Trade Unions and other Federations including NFPE against the anti-people and anti-worker policies of the Govt. a grand success in the Postal Sector. As the Secretary General, National Federation of Postal Employees he built the unity of all the Postal employees and conducted various trade union actions which have prevented the adverse effect of implementation of the new economic policy in the postal sector and to save the postal service as a public utility service. The mass recruitment to the extent of 30% and more in the postal is the major advancement of the Federation for which the skill and negotiating capacity of the Secretary General NFPE Com M. Krishnan are fully exploited. The fight against closure of 9797 Postoffices and 300 RMS offices in the name of McKincey Consultancy’s recommendation, the campaign against the New Postal Policy and the move of the Govt. to privatise postal services by granting licence to Courier Services, the Cadre Restructuring agreement etc are examples of his uncompromising stand, hard-bargaing and negotiating skill. His capacity to make inspiring and educative speeches and also taking class are worth emulating. This Central Working Committee of this Union, while saluting Com. M. Krishnan for his devoted and dedicated service to the Central Govt. Employees and Postal employees, especially to the CHQ of AIPEU Group ‘C’ hereby resolved to utilize the valuable and experienced services of Com. M. Krishnan in the AIPEU Group ‘C’ (CHQ) till the next All India Conference to be held in June 2015. III. E.mail received from Shri.D.Theagarajan, SG, FNPO. In regard to the services rendered by Sri M.Krishnan to the employees, I am unable to find words to express my appreciation towards him. In the last few years my relationship with him is very cordial and it became useful to the Postal employees. His manner of approaching official side with the issues of staff is bold as well as of positive nature . So far I do not find negative attitude in him during the negotiation with official side. The retirement of Shri M.Krishnan from the Department is a great loss to the Postal employees in particular and central government employees in general . In fine , I feel that a good friend of mine is retiring from the service.. I pray to the Almighty to shower blessings on him and his family members to give happiness and prosperity . • Bank account for each household is a "national priority"
The Prime Minister, Shri Narendra Modi, has written an email to all bank officers, referring to his Independence Day announcement of the Pradhan Mantri Jan-Dhan Yojana – the National Mission on Financial Inclusion with the objective of covering all households in the country with banking facilities, and having a bank account for each household. Describing the task as "gigantic," the Prime Minister said, "We need to enroll over 7 crore households and open their accounts. This is a national priority and we must rise to meet this challenge. There is an urgency to this exercise as all other development activities are hindered by this single disability. I am sure we will overcome this situation collectively." The Prime Minister has urged bank officers to "put your shoulder to the wheel and try your level best to ensure that no one is left without a bank account. This itself will be a source of immense satisfaction for you and your teams. I will myself recognize the achievements of the best performing branches." The Prime Minister said: "The Pradhan Mantri Jan Dhan Yojana lies at the core of our development philosophy of Sab Ka Sath Sab Ka Vikas. As we move rapidly forward in this knowledge era with modern banking and financial systems, it is untenable that a large majority of our population is deprived of basic banking facilities. I sometimes wonder whether we have made matters so complicated that the poor and the marginalized are those who are trapped in a perpetual cycle of exclusion and deprivation. We need to break that cycle and the Jan Dhan Yojana is the first step in that direction. With a bank account, every household gains access to banking and credit facilities. This will enable them to come out of the grip of moneylenders, manage to keep away from financial crises caused by emergent needs, and most importantly, benefit from a range of financial products." As a first step, under the Pradhan Mantri Jan Dhan Yojana, every account holder gets a RuPay debit card with a Rs 1,00,000/- accident cover. "As we go along, they will be covered by insurance and pension products," the Prime Minister said. "I am confident that you will rise to the occasion and contribute to this national endeavour in significant measure. I am there to support you," the Prime Minister added. The Pradhan Mantri Jan Dhan Yojana will be launched on 28 August, 2014 across the nation simultaneously. The Prime Minister will launch it formally in Delhi, with parallel functions at the state level which will be attended by Union Ministers, and also at district and sub-district levels. Camps are also to be organized at the branch. Subject :- Economy in use of paper. (iv) Office copies should not be typed again where the draft itself is legible and does not contain many corrections. (v) Forms, proformas, returns etc., if any, stipulated by Ministries/ Departments/Organizations in connection the organizational mandate may be reviewed in relation to their size and format and should be recast and simplified/shortened in keeping with the recent directives from Cabinet Secretariat. Manual submission of forms, returns, etc,, wherever stipulated, either under statutory obligations or otherwise, should be discouraged, Switching over (oc-forms, online submission of forms/returns, etc., may be encouraged. 3. This has the approval of Secretary(Expenditure). 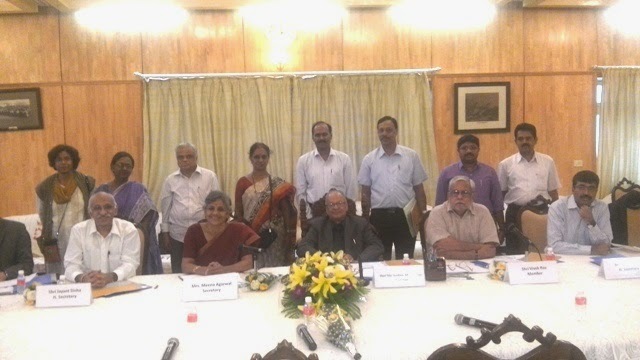 The meeting with CHAIRMAN AND MEMBERS of 7th Central Pay Commission was held at Bangalore 0n 24th August 2014 for about 50 minutes. The following members of COC Karnataka participated in the meeting. (Representing department Survey of India). (Representing department Income Tax office). The President Com Radhakrishna welcomed the Chairman and Members of the 7thCPC for the meeting. The General Secretary Com P.S.Prasad presented the power point presentation. Com Radhakrishna, Com P.S.Prasad, Com Muthukumar , Com Vinod, & Com Ramakrishna spoke effectively on various subjects. It was brought to the notice of the commission that the cost of living is high in Bangalore compared to other metro cities in the country and the prices of all essential commodities are comparatively high in the State of Karnataka. House rent is in the range of Rs 7000/- per month to Rs 35,000/- per month. The private school fees is from Rs 25,000/- to Rs 50,000/- per year. Donation is also too high, the cost of local transportation is from Rs 2000/- to Rs 10,000/- per month. a) Since Government is a model employer, they should provide minimum wages as per the 15 ILO conference and other wages as per the educational qualification & skill requirement of the job . b) Higher skill requirement due to computer usage and modernisation of equipment's. The skill requirement is higher compared to earlier days due to technology advancement. c) The higher inflation which is existing from the last eight years which is effecting the Government Employees, the money value has gone down to a large extent & there is erosion in wages. d) The salaries of the Government Employees are fully accounted for tax calculation, whereas in private sector allowances are not taxed. It was brought to the notice of the commission that to attract higher talent to Central Government higher pay scales should be given. a) For the same post which include similar duties and responsibility, there are different pay scales/ Grade Pay existing for same nature of duties and similar recruit qualifications. b) Grant of Grade Pay Rs.4800 to all Supervisors cadre. c) The gazetted Group “B” post be started from Rs 5400/- GP. d) LDC pay scales should be provided with Grade Pay of Rs.2400 as their minimum qualifications is 12th std. e) There should not be any discrimination in the Pay scales of CSSS Cadre and Subordinate Departments since the nature of work being carried out by them is similar. Hence, disparity is to be removed. f) The Drivers of Subordinate offices be placed with starting pay of Rs 2400/ GP as in Lok Sabha Secretariat. g) Graded structure for MTS should also be recommended as the 5th CPC vide para no 53.13 had recommended graded structure for these MTS. h) Pay scales of Stores wing persons be upgraded considering their work load and level of responsibility. i) Provide additional increment w.e.f. 01.01.2006 to staff working in old pay scale Rs.7450-11500 as in case of Inspectors of Central Excise and Income tax departments. Increment rate of 5% and Promotion policy. It was brought to the notice of the commission that on Increment rate of 5% and Promotion policy. a) As the Government employee put more and more service, he will be more trained to perform his duties in a better befitting manner. Thus the Government is more beneficial as good quality of work can be expected from an experienced official. b) His family responsibility will increase with age. c) They has to educate the children in professional courses, marriage of his children has to be performed, his medical expenses will also increase. d) There should be adequate financial protection for him, the better rate of increment should motivate him to work more. e) The person joining a Central Government Service is not just for the employment is for a whole career. f) On promotion one shall get two additional increments subject to an minimum salary increase of Rs 3000/- per month as he will perform higher duties and responsibility's. g) He shall get not less than five financial up gradations in promotional hierarchy during his service to motivate him to work more. h) Similarly the scientist are provided to FCS and get promotions every 4 years. Consumer Price Index & Dearness Allowance Formula. It was brought to the notice of the commission that on Consumer Price Index & Dearness Allowance Formula. a) CPI as on 1/1/2006 was 115.76 points. b) CPI as on 1/1/2014 was 237 points. c) The CPI has increased by 121 points . d) But the DA increased by just 100% as on 1/1/2014 from 1/1/2006. e) The actual DA should have been 121 % not just 100% as on Jan 2014.
f) Actual increase in price rise is more than 200 % and DA should have been more than 200%. g) 6 months average DA computation of Consumer Price Index should be provided to Central Government employees rather than 12 months average. a) All allowances such as HRA, Tour DA, CEA (tuition fees) , Cashier Allowances, etc. should be increased by four times. b) OTA & Night Duty to be paid on par with Railways . c) When ever there is an increase in Dearness Allowance, the above allowances be also increase as in the case of Transport allowance. a) The field oriented organizations like CGWB, Survey Of India, GSI, IBM, IMD, etc. most of the categories remain in fields, even Postal Employees and AG's Employees are effected. b) Now the field going staff are deprived of earlier CCA and present Transport Allowance as they cannot fulfill the condition of at least one day stay in a month in head quarters. c) This condition of being present at Hqrs. Office at least a day in a calendar month becoming eligible for transport Allowances should be removed. a) The Fifth Central Pay commission in its report vide para no105.12 has said that Dearness allowance be paid free of net taxes as the DA is paid for compensation against price rise. All other allowances should also be paid net of taxes which has been examined by 5th CPC in para no 167.
a) More CGHS hospitals should be made available or alternatively the person should have the option to choose any of the hospitals of his choice and the bill to be passed with AIMS rates. b) Existing CGHS system needs improvement. c) Proper ward entitlement should be made as per grades. d) Cash less facility for hospitalization. It was brought to the notice of the commission that on following issues. b) Non-filling up of vacant posts has resulted in increased work load on the existing employees. c) Lower Spending by Central Government on its Employees. e) 12 days Casual Leave. f) Restrictions EL of 300 days to be removed. g) The PSU are providing reward medals after 15 years, 25 years and end of service, similarly such reward should be provided to Central Government Employees. h) In case of death of Government Servant during while on duties, his family members should get compassionate appointment not considering restrictions of 5%. i) Education Loan should be provided. Reg : Payment of Interim Relief and Merger of Dearness Allowance with Pay. The Staff Side of National Council (JCM) , had raised the issue regarding payment of interim relief and merger of dearness allowance with pay , as an Agenda Item of the Standing Committee of National Council (JCM ) in its meeting held on 7th May, 2014. After detailed deliberations , it was stated by the Secretary (Expenditure), Ministry of Finance on this item that since the terms of reference enables the 7th CPC to send Interim Report , as such, the Staff Side might approach the Pay Commission for a report on Interim Relief and Merger of Dearness Allowance, as recorded in the Record Note of meeting, forwarded to Staff Side vide Director(JCA), Government of India, Ministry of Personnel, Public Grievances and Pensioners , Department of Pension and Pensioner’s Welfare ‘s letter No. 3/9/2014/JCA dt.24/7/2014. We, therefore, humbly request you to kindly favourably consider our demand of payment of Interim Relief and Merger of Dearness Allowance with pay as Dearness Allowance, has since crossed the value of 100% on 1st January, 2014 and a number of Government Employees are superannuating every month,who would be deprived of the benefit of the same. While answering to a question in Parliament on 18.7.2014, Finance Minister Shri Arun Jaitley said in a written form regarding the details of Children Education Allowance that it has been informed by the Department of Personnel and Training that the annual ceiling limit for reimbursement of Children Education Allowance (CEA) is 18,000/- per child. The Hostel Subsidy shall be 4,500/- per month per child. The annual ceiling for reimbursement of CEA for disabled children of Government employees is 36,000/- per annum per child and the rates of Hostel Subsidy for disabled children ofGovernment employees is 9,000/- per child per month. These revisions are applicable with effect from 1st January, 2014. The reimbursement is admissible for the children studying in institutions affiliated to any Board or recognised institution, whether in receipt of Government aid or not, recognised by the Central or State Government or Union Territory Administration or by University or a recognised educational authority having jurisdiction over the area where the institution is situated. BANGALORE CAT JUDGEMENT ON O.T.A.